The Freedom Archives produces pamphlets to draw attention to freeing political prisoners. We have created pamphlets focusing on women political prisoners in Palestine, messages of solidarity from US-held political prisoners to political prisoners in Palestine, messages from US-held political prisoners commemorating the 47th anniversary of the Black Panther Party, a pamphlet celebrating the release of Puerto Rican Oscar López Rivera and a full-color book of paintings by Tom Manning. 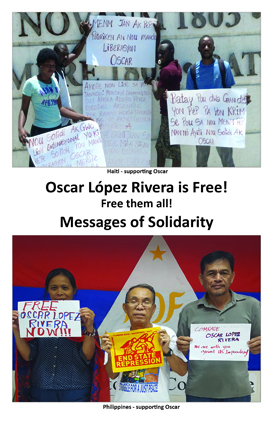 We published this pamphlet to celebrate the release of Oscar López Rivera, who spent almost 36 years in US prisons because he struggled for the independence and sovereignty of Puerto Rico. Inside are messages of solidarity from political prisoners and support groups from all over world. Oscar López Rivera was a leader in Fuerzas Armadas de Liberación Nacional, or Armed Forces of National Liberation, in the 1970s and 1980s. The FALN was responsible for more than 100 acts of armed propaganda in cities such as New York and Chicago. He was convicted of seditious conspiracy in 1981 and sentenced to 55 years in prison. He had previously been offered commutation, but López Rivera had refused because not all imprisoned FALN members would have been released at that time. Members of the Prison, Labor and Academic Delegation to Palestine, working with The Freedom Archives, have developed and released a new booklet focusing on the struggle of Palestinian women prisoners. “For the Love of Palestine: Stories of Women, Imprisonment and Resistance” highlights the cases of ten present and former Palestinian women prisoners and the continuing struggle of Palestinian women for justice, return, and liberation. Including an introduction by the editors, the booklet contains a map of prisons and detention centers in occupied Palestine, a glossary of important terms, a reflection by Laura Whitehorn about mutual struggle, and a resource guide, as well as presenting the stories of specific Palestinian women and solidarity messages from US political prisoners. The booklet includes the cases of Dareen Tatour, Khalida Jarrar, Dima al-Wawi, Lina Jarbouni, Mona Qa’adan, Ihsan Dababseh, Natalie Shokha, Lina Khattab, Hana Shalabi, and Rasmea Odeh; it also includes solidarity messages from Herman Bell, Jalil Muntaqim, and David Gilbert. In late March, a delegation of nineteen prison, labor, and scholar-activists from the United States traveled to Palestine. We were the first U.S. delegation to Palestine to focus specifically on political imprisonment and solidarity between Palestinian and US prisoners. During our ten-day trip, we heard the stories of a diverse group of Palestinians who daily resist land confiscation, house demolitions, restrictions to water access, restriction of movement, summary executions, and mass imprisonment. In the face of Israel’s system of racialized terror, Palestinians uphold their commitment to “sumud”—a concept with historical ties to the Palestinian liberation movement defined as “steadfastness” or standing one’s ground on the land with dignity—as a form of resistance. A central feature of the Zionist colonial project is political imprisonment and their hope that this will break the Palestinian struggle. Over 800,000 Palestinians have been imprisoned since 1948 and prison seems to be a commonality in the lives of almost all Palestinians. In order to link the voices of US-held political prisoners with global struggles for self-determination and liberation, we published a pamphlet of statements from US Political Prisoners in solidarity with the liberation struggle of the Palestinian people. With the assistance of Birzeit University’s Institute for Women’s Studies, the pamphlet was translated into Arabic, printed, and we were able to distribute approximately 500 copies throughout our trip. In honor of the 47th anniversary of the Black Panther Party, we published this pamphlet which compiles statements from the many Political Prisoners and Prisoners of War who have now been locked up over three and four decades. and a special dedication to Marilyn Buck who lived her life like a Panther, Safiya Bukhari who fought her whole Panther life to free political prisoners, and Lynne Stewart whose life’s work was to defend the oppressed. Dedicated also to all those who have and continue to fight for justice, self-determination, and liberation of our peoples. 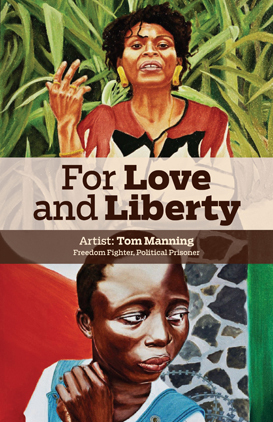 This book features over 80 full-color paintings made between 1996 and 2005 by freedom fighter, political prisoner, and prolific artist Tom Manning. His paintings are stories that jump off the page, revealing the outlook of people who struggle for liberation around the world. I’m overwhelmed by the talent, indomitable will, and purity of heart displayed here. To say that I am awed by this book does not do it justice. Tom’s been incarcerated for nearly 35 years. But even before he received his current life sentence he was trapped by the limited choices left to an impoverished child surviving in Boston’s infamous Maverick Street Projects. The military during the Vietnam era seemed like a way out, but that too became a hellish form of confinement.